Finally ditched my 1500/384 ADSL for Cable, no regrets. 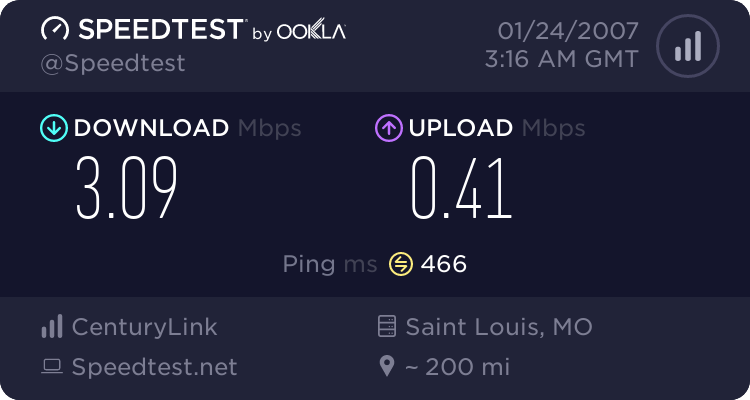 About 6x the download speed and 2x the upload speed for the same price ($44.95/mo + tax), I should have did it years earlier. 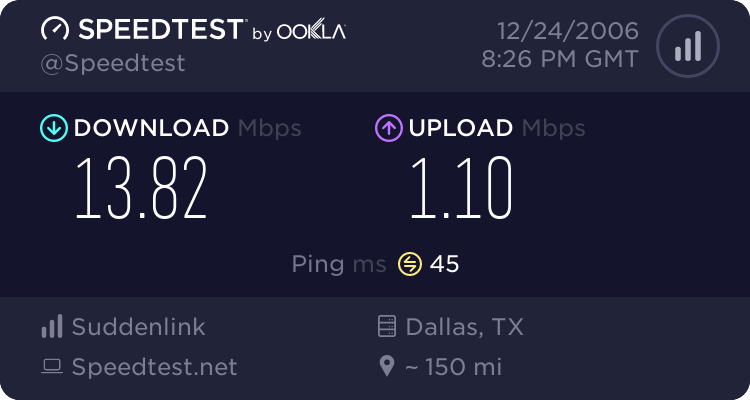 My actual download speeds level out at about 954 KB/sec. I am happy I moved. This is much better thatn I ever got at the old place! To keep with the original requests of this thread I re-tested with Speakeasy and am providing the required information. Price $48.99/mo. 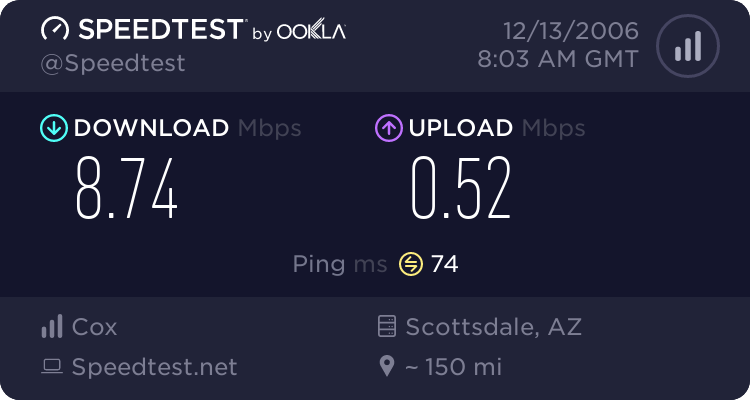 This is only $4.00 more than I paid for Roadrunner before I moved and it wasn't even close to this speed! I don't think LIN will want to move in with Leishi now. 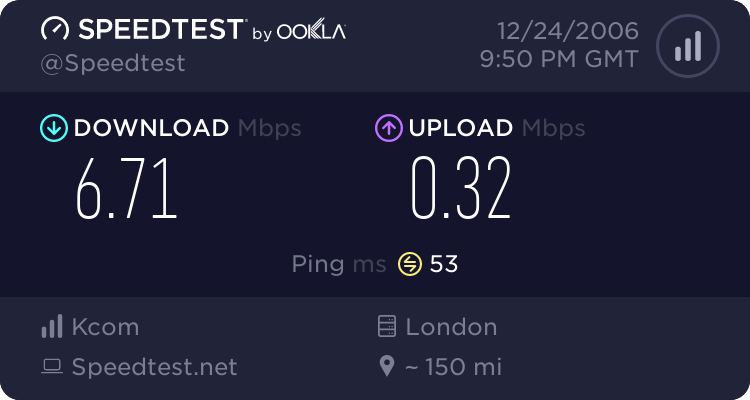 Nobody gets 24mb in the UK, phone lines are just not up to it. I get 5MB for £17.99. Yeah, unlimited with Tiscali broadband. Its £17.99 for 8MB but they said we could only receive 5MB. Still not bad, though. I don't use P2P or torrents. My brother does, occasionally and I have not noticed any problems. 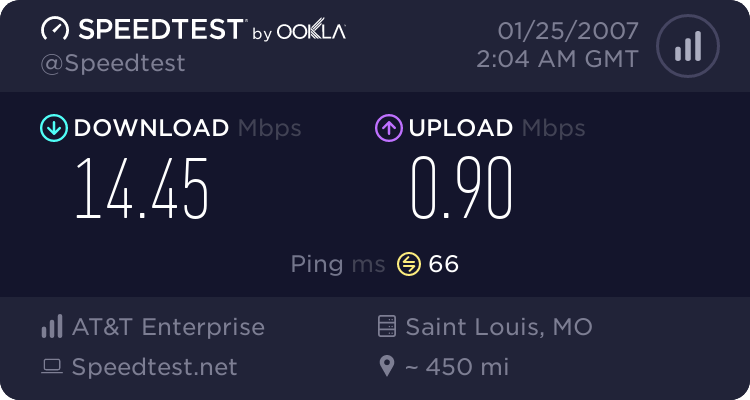 The line drops, sometimes but I think that's due our router. i think pipex are trying to sabotage me! How much do you pay? How long left, if your on a contract? 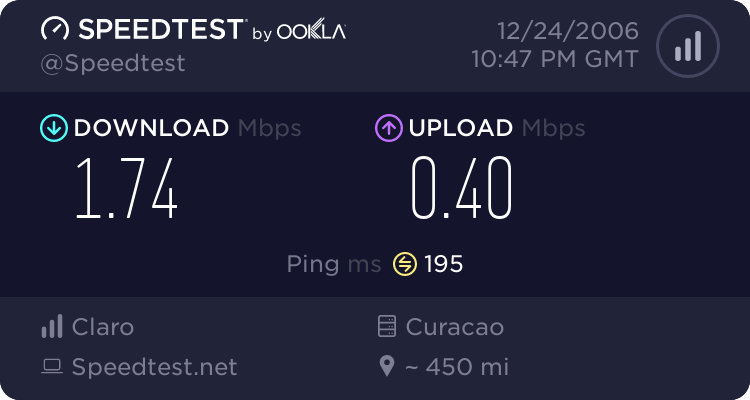 Just wondering: What would be the average download speed for 5MB, that is used between two computers? 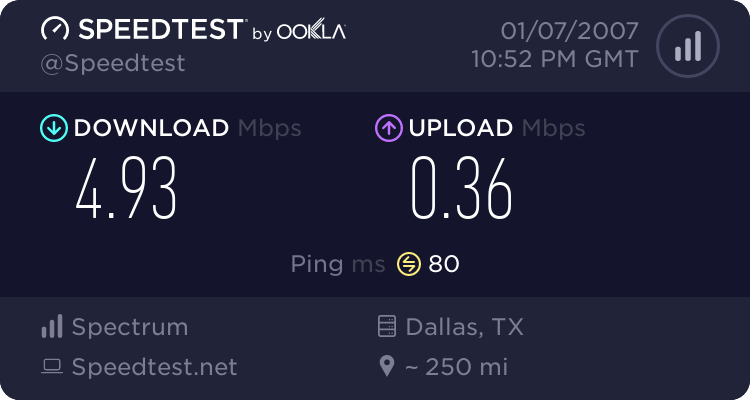 since when does DSL hit 5000kb/s? $10/month cheaper and I never did need a land-line phone. Cell works fine. Thats ATT for ya... I love mine. I'm guessing thats the Elite package? Yes it is, cool part about the whole thing, is that I was paying 32.99 or 37.99...can't remember for the 3MB/512KB package you are using....it cost me less for twice the down...I was like...sign me up !! When will someone make a test for fast connections? I need an explanation please. NOW!